Health management of your flock in alternative system involves choosing the right breed, feeding program, and system design. After that, it's up to you to plan, observe, and adjust. In the past, managing health in a cage system layer house involved few steps. 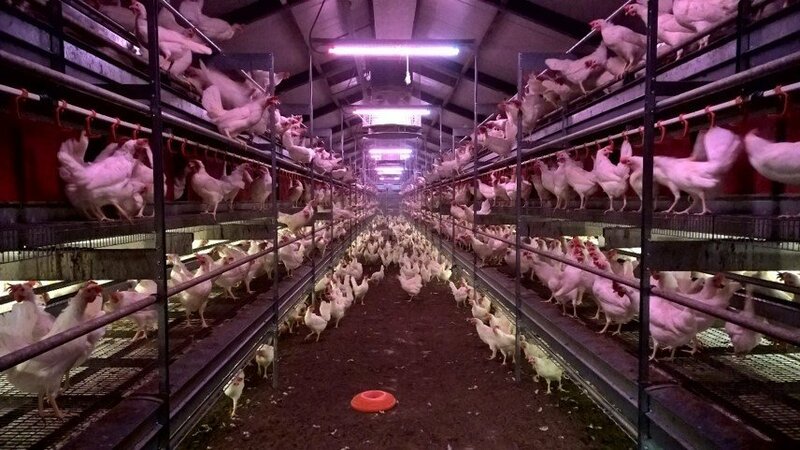 As many experienced egg producers know, a conventional cage system means small group sizes, climate controlled houses, lower dust concentration, easy access to feed and water, and a lower risk of disease. Manure can be easily separated and removed from the birds, and the eggs are delivered and collected in a clean and easy to manage system. However, from a welfare perspective, the alternative systems allow the birds to express natural behaviours such as perching, scratching, and wing flapping. When making the switch to an alternative system, how can one maintain good health within the flock? The good news is that once you have spent some time observing the birds in the system and then making the necessary adjustments, it is possible to achieve the same technical results as in previous cage systems. Time is the biggest investment. The first factor when choosing what breed to use in your operations is whether you are serving a white or brown egg market. After determining which colour breed is needed, it is important to use a breed that is docile and robust when using an alternative system. Within a cage free system, the birds are able to move freely and express natural behaviours, so they use significantly more energy in their daily activity. For this reason it is important to start out with very robust birds that continue to produce a high number of eggs, maintain good health and are able to resist disease. Additionally, the birds must be able to seek out their feed and eat well, especially during the rearing process. Starting with a breed that has the drive to eat and will explore the system in order to find food and water will go a long way in maintaining good health. 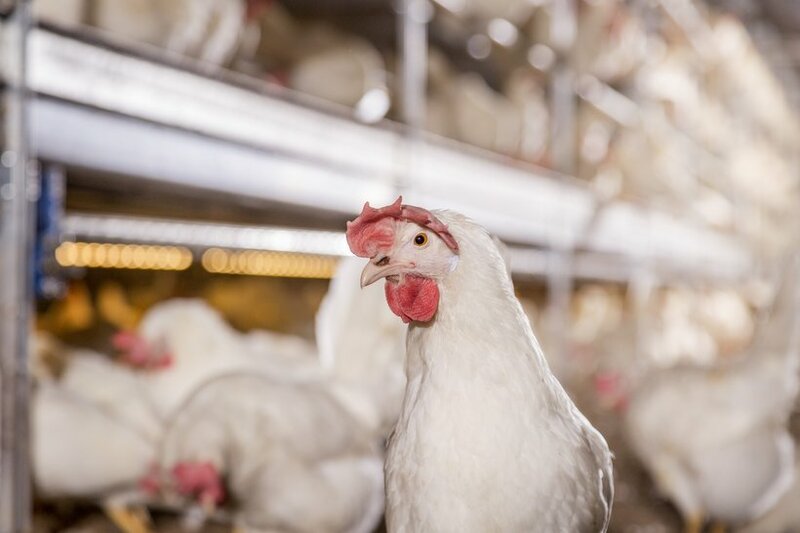 During the rearing process, the goals are to achieve low mortality and make sure pullets are strong with high uniformity; pullets should be trained in moving around the system, keep a high feed intake, and maintain clean and undamaged feathering. This is all possible by starting with the right genetic solution. In addition, make sure that the system used for rearing is the same as what is used during production. Training is important so the birds can learn where to nest, eat, and keep busy. Using the right breed will also affect how you lay out the house so that the birds are able to access food, water, and nests. For example, white birds are more mobile and are able to navigate the different levels of an aviary system without posts for support, whereas brown birds need more support such as ladders between levels. Keeping your birds' behaviour in mind when choosing a house layout will help prevent injuries when navigating the system. The feeding technique used when managing hens is a key factor in achieving the best possible shell quality and nutrition levels. The empty feeder technique is helpful for this goal. 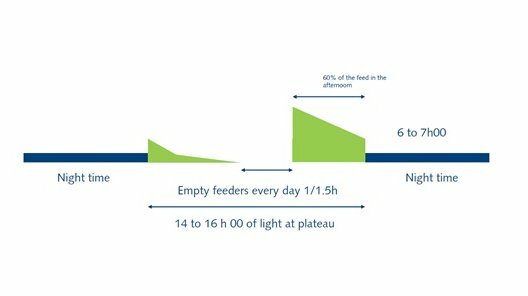 To encourage natural feeding behaviour, especially in an alternative system, it is advised to provide at least 60% of the daily feed in the afternoon and before this period start, the feeders should be emptied in the middle of the day for 1 to maximum 1.5 hours. Applying the empty feeder technique controls body weight, flock uniformity and egg shell quality because the total diet is consumed daily, including the fine particles containing important vitamins, minerals and amino acids. Consult your technical expert or nutritionist for more detailed information on using the right type of feed for your birds. Choosing the right aviary system as well as the right lighting is extremely important in an alternative system. It allows you to manage behaviour and guide the birds to be able to eat and nest properly. First, be sure to light where the birds can access food and water as well as the litter areas to prevent floor eggs. Additionally, the color of the light used matters in maintaining docile behaviour. It has been found that warm spectrum lighting can calm the birds, whereas brighter, blue-tinged lighting can increase aggression. Ventilation is another important factor. In an alternative system, fine dust is increased and can cause health issues. Using the right method of ventilation to reduce the dust and circulate air will improve efficiency and health. The air must flow so it is distributed evenly. This will keep ammonia levels low, litter dry, and the birds comfortable and productive. For an alternative layer house to be successful, the design of the system, breed selection, and nutritional profile need to work together. When you have each piece in place, be sure to observe and adjust as needed. Once you have committed the extra time to learning the system, it is possible to keep the birds healthy and producing at their full potential.